Kilauea Volcano Update: The lava flows have enveloped our accommodations, and we are stranded here, with access to only our white sand beach and a Hawaiian Shave Ice Shack. Please do not send help. Yafa owning her time at Kahalu'u. This morning we took a road trip to Kona, hitting Kahaluu by 8:30 am. The first time I came to this place, I saw a dingy, overused seaside park with overflowing trash cans and locals crammed onto picnic tables. It took me another visit or two to realize that the spirit of Hawaii is here, both on the land and in the water. Locals gather with family to grill fish over coals from the Kiawe tree. Tourists don masks and snorkel to see coral, fish, and turtles up-close and to feel the black sand beneath their feet. People learn how to surf the gentle waves hitting the reef here. When you can see the beauty in Kahaluu, you can start to understand Hawaii. It’s almost too obvious to see. The swim we planned was from Kahaluu to Magic Sands Beach - from a black sand beach to a white sand beach. The exit to open water from the bay at Kahaluu is tricky, with a surf break on one side and a shallow ledge on the other. Guest Rick and I chose the shallow ledge side, waiting out a set of waves before hustling out. Rick is a waterman, having spent years sailing San Francisco Bay, and together we plotted our course to Magic Sands. 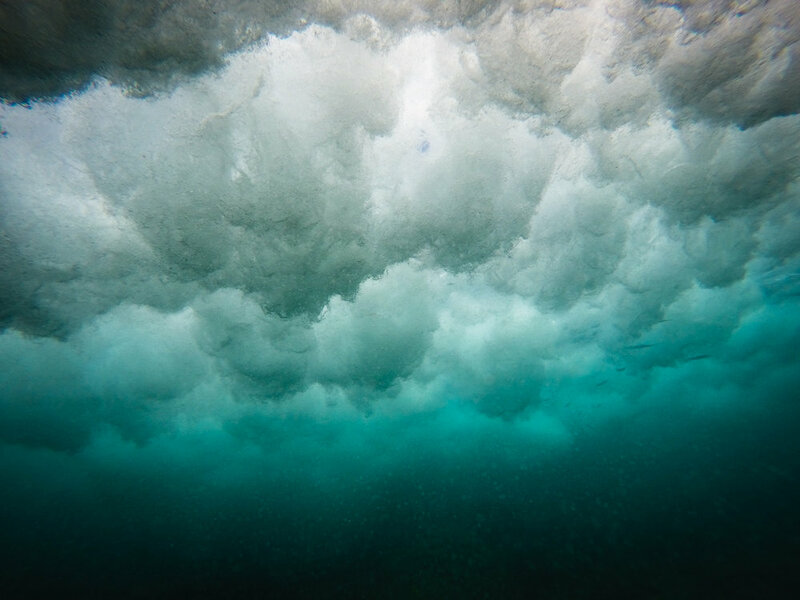 The bottom dropped out beneath us, and the wind died, leaving a glassy but bulbous surface and a view of nothing but deep blue beneath. The exit from the swim at Magic Sands can be just as tricky as the entrance, with waves that get very tall in a very short amount of time. It takes patience and timing to get out safely, which we did. A huma huma shows off her colors on our underwater tour of Kahaluu. The surf break challenged us as we exit the black sand lagoon. 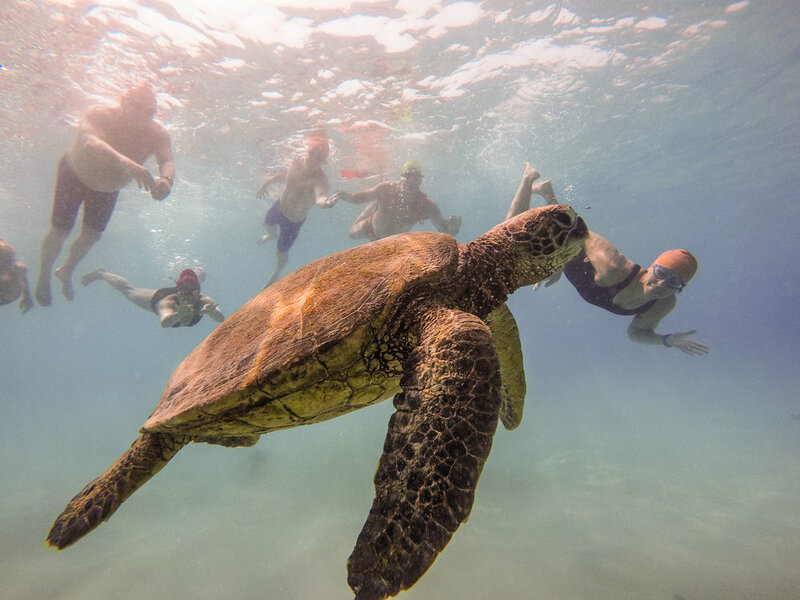 Ryan got this shot of our swimmers and a Pacific Green turtle who lives at Magic Sands. Karen faces a small break at Magic's as the boogie boarders wait for the next set. The scene at Magic's after our swim. We filled up with gas and Kona coffee on the way home, where we let the afternoon unspool slowly. Guests John and Frances gritted out their daily run, returning covered in sweat but satisfied. Here’s a behind-the scenes look: Do you remember those fish we caught yesterday? Well, we shoved them in a cooler with ice. Clare talked us out of eating them, so guide Ryan gave them away to some locals at Magic Sands, which left Heather and I with a fishy smelling cooler full of fishy smelling ice packs and fishy smelling cans of Perrier. So we scrubbed. And wiped. And scrubbed. Then rubbed the inside with a lime. It worked. We had to jump in the ocean to get the smell off of us, slightly leery of jumping into these waters while covered in fish oil. The water was glassy with no wind at all and the vog creating a soft, diffuse light. Hopper enjoying our home pool after our fish cooler experience. Amanda and Marcy, our massage therapists, arrived soon after. While they worked their magic on our guests, Clare showed up with Poke, Guacamole, and a cheese platter. Suffering remained at a minimum through a dinner of chicken curry which paired nicely with a Riesling. The massages seemed to have sapped our guests of their remaining energy, and they landed heavily in their beds. There’s a wedding next door, which we are hoping will quiet down soon. We’d complain, but the roar of the volcano is starting to drown them out, anyway. The Pacific like velvet tonight, under a soft sky diffuse with Pele's breath. This island grows. Tomorrow we'll make the most of our last full day.